Is Ken the man to tackle our biggest challenge? What do our three mayoral candidates stand for? The Liberal Democrat Brian Paddick, a former assistant Metropolitan Police commissioner, would certainly be a safe pair of hands in bringing the Met into more essential, stronger, democratic control. A gay man, it seems he would get the “gay vote”, whatever that represents – a negative factor in my view. Gays can be reactionary right-wingers, dogmatic lefties or just apolitical. Boris Johnson appears to be indifferent and mischievous. An amiable man, an engaging journalist, he startled me by talking about his youth on the streets of Camden. I thought it had passed in the cloistered and privileged Eton College. A more severe haircut is not sufficient to qualify Boris the Beautiful for the non-existent mayoral chain. Ken Livingstone – apart from the Green candidate – is the only one who anticipated and now foresees the big and immovable issue: climate change is the dominant factor of all political reality. Already the congestion charge and the raft of cuts on carbon footprints are to his credit. In my grandchildren’s time, Londoners will feel the sharp effect of climate change as mass migration will arrive with staggering figures from the south, particularly Africa, and from the north of Europe. London’s population has begun to climb from seven million towards 10 million, throwing an additional burden on stretched public services. This will accentuate deep social divisions between the mega-rich and those in poverty. Polarisation fraught with trouble. 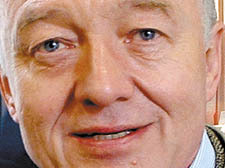 Ken Livingstone has worked hard for 15,000 new homes for London, a modest attempt to alleviate a public disgrace. His anti-racism credentials are clear and there is no real evidence of anti-Semitism that I have ever witnessed or indeed would have tolerated. He fights for London as he did in taking on the then Chancellor Gordon Brown over finances for Crossrail, and Londoners rarely see the fierce anti-London lobby in the Parliamentary Labour Party. He argues constantly for a fairer allocation of our taxation to come to the capital – we get less per head than Scotland. Finally, he has an agenda for London, leaving the others with a month to catch up. In the past few years, he seems to have learned that after hubris comes nemesis, or in plain words: pride comes before a fall. He is, in spite of many little dips, a deserving case for a third term and that’s not just to allow him to bow low to the Queen at the opening of the 2012 Olympics.